Spider-Man: Homecoming is a 2017 superhero film and drama from director Jon Watts. It is the sixth film in Columbia Picture's Spider-Man film franchise, but it is the first in a new film trilogy. Spider-Man: Homecoming is also a co-production between Columbia and Marvel Studios, making it the sixteenth film in the Marvel Cinematic Universe. Homecoming finds Peter Parker trying to balance his life as a new threat to the safety of New York City emerges. Spider-Man: Homecoming focuses on Peter Parker (Tom Holland), who is the superhero, Spider-Man. Peter quits his high school's academic decathlon team so that he can spend more time focusing on his crime-fighting activities as Spider-Man. He tells his guardian, Aunt May (Marisa Tomei), his friend, Ned (Jacob Batalon), and his classmates that he needs to spend more time on the “Stark internship” given to him by Tony Stark/Iron Man (Robert Downey, Jr.). One night while patrolling his neighborhood, Spider-Man sees a group of criminals robbing an ATM. Upon confronting them, Spider-Man discovers that they are using highly-advanced weapons to which they should not have access. 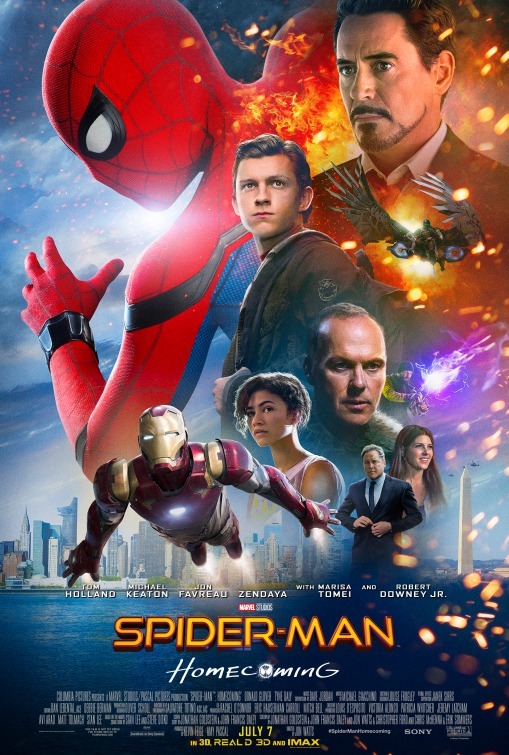 Through tenacious investigating, Peter learns that the weapons are being produced by Adrian Toomes (Michael Keaton), who owns a salvage company, by using alien technology he scavenges and steals as necessary. Peter is determined to stop Toomes, who wears a high-tech Vulture-like suit. However, Peter's Spider-Man activities are causing friction between him and his mentor, Tony Stark, and threatens not only Peter's life, but also the life of everyone close to him. I really liked Tobey Maguire as Peter Parker/Spider-Man in director's Sam Raimi's three Spider-Man films that started the Sony Pictures Spider-Man film franchise, although I thought that only Spider-Man 2 (2004) was really good. I liked Andrew Garfield in 2012's The Amazing Spider-Man, which I thought, at the time, to be the best Spider-Man film. I don't know if I am ready to give up on Tobey Maguire as the best Peter Parker, but I think that Spider-Man: Homecoming is the best Spider-Man feature film yet. Homecoming really sells the idea that it is about a 15-year-old playing superhero, and the film feels like a teen movie as much as it does as a superhero movie. It is lighthearted and angsty like one of those John Hughes movies from the 1980s (say Pretty in Pink or Sixteen Candles). At the same time, Spider-Man: Homecoming reminds me of Marvel Studios' first Marvel Cinematic Universe film, Iron Man (2008). It is not ironic or coincidental that Homecoming features the movie star (Robert Downey, Jr.) and character from that 2008 film. Like Iron Man, Homecoming focuses on making Peter Parker the center of the story, making Spider-Man a role that Peter plays. Spider-Man is not the most important role in Peter's life; Peter's most important role is being himself. One could say that the first Iron Man movie was about about Tony Stark (as played by Downey) than it was about Iron Man. So it makes sense for Downey/Stark/Iron Man to appear in Homecoming to help Peter Parker find himself as Spider-Man by first finding himself. Late in life, Michael Keaton seems to be convincing more and more people of just how good an actor he is. Keaton and his villainous role (“The Vulture,” although he is never called that in the film) turn out to be quite important to this film because Keaton's performance and the character he plays are a mirror of Peter Parker's situation in many ways. Keaton is so good and effective in this movie that he has earned the right to return in a future film. Homecoming also features a number of good supporting performances besides Robert Downey, Jr. Jacob Batalon is just right as Peter's friend, Ned, who is the perfect sidekick and guy-back-at-the-base. Disney Channel star, Zendaya, makes the most of her role as Michelle Jones, and left me wanting to see much more of her. As Peter's Aunt May, Marisa Tomei also demands more screen time.